Congress established the Organ Mountains-Desert Peaks National Monument May 21, 2014 to protect prehistoric, historic, geologic, and biologic resources. The monument, totaling 500,000 acres, includes the Organ Mountains, the Doña Ana Mountains, the Sierra de las Uvas Mountains, and the Greater Potrillo Mountains. Many areas of the monument are isolated, with few visitors, which is a good reason not to head into the wilderness unprepared. If anything goes awry, there may not be people around and your cell phone probably won’t have a signal. It is a good idea to load up on everything you might need: water, sunscreen, hat, snakebite kit, first aid kit, etc. The mountains in this region are volcanic, sculpted by the same intense geologic forces that formed the Rio Grande Rift. The rugged terrain ranges from Chihuahuan Desert habitat to ponderosa pine at higher elevations. The mountain range is comprised of steep-sided crevices, canyons, grasslands, open woodlands, several perennial springs, towering spires, and lava flows. On a clear day the iconic spires are visible from 100+ miles in every direction. The Organ Needle is the high point in the complex, peaking at slightly under 9,000 feet. The elevation plummets 4,000 feet three miles west of the Needle, making the Organ Mountains one of the steepest mountain ranges in the western United States. Long before the Spanish arrived via the ancient trading path that would become the Camino Real, the Organ, Robledo, Uvas, and Potrillo Mountains were inhabited by prehistoric creatures and long extinct mammals. Later, Paleo-Indians hunted the area, taking shelter in mountain caves. The Jornada Culture thrived in this region. They migrated out of the area in the late 13th century and the Apache moved in, ranging from the mountains to the plains. The Apache were followed by a steady stream of Spanish conquistadors, priests, and settlers flowing north from the Spanish territorial capital in Mexico City. It was the Spanish that named the jagged spires Sierra de Los Organos based on their resemblance to pipe organs. Today, the majestic pinnacles dominate the eastern horizon of Las Cruces, New Mexico. Remnants of New Mexico’s past are strewn across the remote back country. Ancient archaeological sites reflect at least 10,000 years of human occupation. Petroglyphs from three separate Native American cultures have weathered the eons, etched, pecked and painted on remote cliffs and massive boulders. Stagecoach and wagon tracks are visible, stretching across the grasslands to the horizon, a testament to the settlers, soldiers and speculators that streamed west after the Mexican American War. The area is rich in culture, history and natural resources. The Organ Mountains are a few miles east of Las Cruces. The range is a southerly extension of the larger San Andres Mountains. Both ranges create a natural divide between the Rio Grande Valley and the Tularosa Valley. The Organ Mountains were first documented by Don Juan de Oñate in 1598 as his expedition traveled north to establish a colony near present day Española. For 300 years the trail, known as El Camino Real del Adentro, was the sole route north from Mexico City to the provincial capital in Santa Fe. The area around the Organ Mountains was the last opportunity to stock up on water before embarking on the dreaded Jornada del Muerto, “Journey of the Dead Man”. There are several natural springs in the Organ Mountains. They provide a source of precious water in an otherwise parched landscape. As a result, the area is one of the most botanically diverse ecosystems of any mountain range in New Mexico. Whereas the grasslands provide critical habitat for rare birds like the Aplomado falcon and Baird’s sparrow, the sheer cliffs provide nesting and perching sites for raptors, including bald and golden eagles, various hawks, owls, and the critically endangered peregrine falcons. Additionally, it is prime habitat for pronghorn, mule deer, mountain lion, bobcat, coyote, bats, rock squirrels, other rodents, quail, a bevy of birds, and a plethora of arthropods. In case you are wondering, arthropods are creatures with exoskeletons, segmented bodies and jointed legs, like tarantulas, of which there are many. Tarantulas are exceptionally large, furry, scary looking spiders, but they are not dangerous. If you encounter one, ignore it and go around. Don’t take close-ups for ten minutes before remembering they can jump. That would be me. The most spectacular section of the Organ Mountains is the Needles, a jagged ridge of eroded granite pinnacles that rise a mile above the Rio Grande to the west and the Tularosa Basin to the east. The granite spires were created by pyroclastic flows and lava almost 34 million years ago. The massive towers of barren rock are cleft with narrow fissures containing narrow swaths of lush oak trees. Folsom points left by ancient hunters have been found in multiple caves. trchaeologists found evidence that humans were in the region 8000-12,000 years ago in The caves near Peña Blanca and La Cueva. They excavated the La Cueva rock shelter in the 1970’s and found numerous artifacts confirming occupancy by various tenants over the millenniums, starting with Paleo-Indians 7,000+ years ago. Archaeologists excavated the Peña Blanca caves in the 1980’s and discovered the earliest known cultivated corn in the U.S. The Needles provide a scenic backdrop to the BLM-managed Aguirre Spring Recreation Area, 21 miles east of Las Cruces. Take U.S. 70 for 14 miles east of the I-25/U.S. 70 interchange in Las Cruces, then turn south on the Aguirre Spring Road (1.1 miles after San Augustine Pass) for six miles. At mile 4 the road becomes a one-way loop and climbs steeply. Aguirre Spring is located in a sheltered valley on the northeast side of the ridge. The campground is at 5,700 feet, making it significantly cooler than the desert lowlands. The campground has few facilities and is not suitable for large RVs. There are two hiking trails. Pine Tree Trail is a 4.2 mile loop trail, usually low traffic. This trail is a bit more taxing than dripping springs…call it moderate to taxing (based on being acclimated to high altitude). The wild flowers and foliage is beautiful, an oasis in the desert. When it rains or there is snow melt, the spontaneous waterfalls at Aguirre Springs are stunning. The campground allows dogs. Fees are $3/day for day use. $3/night to camp. $25 reservation fee for the two group campsites. The 6-mile-long Baylor Trail is the only maintained trail that traverses the Organ Range. 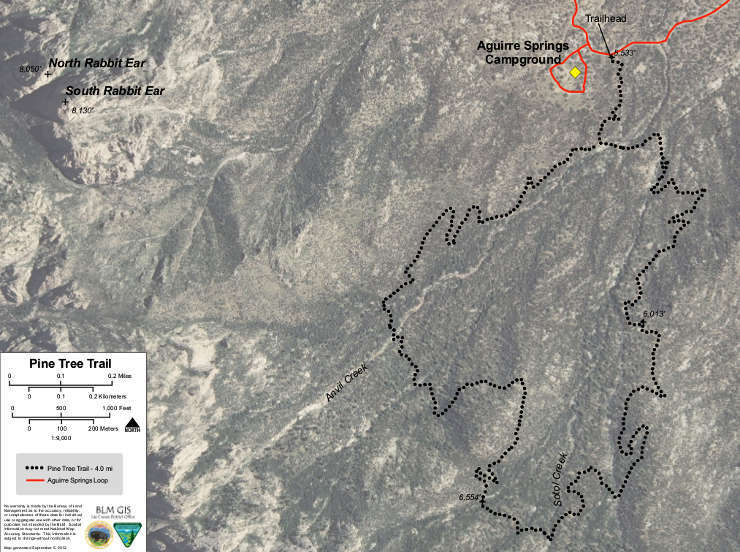 There are two trailheads, one on the east end at the Aguirre Springs Recreation Area, and the other on the west end just off Baylor Canyon Road. The east trailhead is at an elevation of 5,540 ft., rising to 6,430 ft. at Baylor Pass, then down to 4,865 ft. at the west trailhead. The pass is approx. 2.5 miles from the east trailhead. There is also a great opportunity to bag a summit. Head north from the top of the pass and work your way along the west side of the ridge to reach the summit of Baylor Peak (elev. 7,721′). 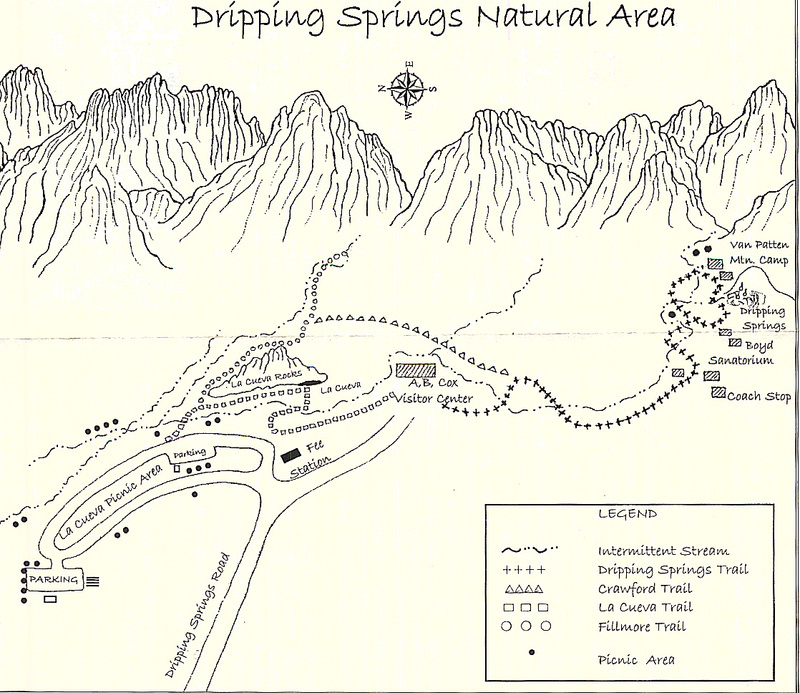 The Dripping Springs Natural Area is located 10 miles east of Las Cruces. From Exit 1 on Interstate 25, take University Avenue/Dripping Springs Road east to the end. There are excellent wildlife viewing opportunities in this area, with almost 5 miles of easy hiking trails. Dripping Springs Trail is one of the most popular, with desert scrub, pinon-juniper and oak woodlands adorning the route to the ruins of the Van Patten Mountain Camp and Boyd’s tuberculosis sanitarium. Van Patten’s Mountain Camp was built in 1870, providing relief from summer heat for residents and travelers alike. A couple of decades later, Dr. Nathan Boyd built a sanatorium. Today the buildings receive thousands of recreational visitors every year, tourists and locals alike. Dripping Springs Trail intersects with the Crawford Trail at the ¾ mile mark. Stay on the right fork to stay on Dripping Springs Trail. At about 1.3 miles there is a fork in the trail. Take the right branch. Take a right at the next junction as well. The old Boyd Sanitarium is about 0.1 miles. When looking at the dining hall, look for the rock stairway on the left side. Follow the stairway up and left to the waterfall above the area. Return on the same path. Return to the prior junction and take a right. The remains of the Van Patten Mountain Camp is about 300 feet up the trail. After exploring the camp, continue around the loop trail to the main trail to return to the visitor’s center or to hike the other loops. La Cueva Trail has a spur that goes to the Hermit’s cave, an Italian gentleman that took up residence for a couple of years at the end of the 1860s. It didn’t end well. When friends went to check on him, they found him dead, with a knife through his back. The murderer was never apprehended. The La Cueva Trail has an additional spur that goes into a dead end canyon with a nice waterfall. A tiny desert oasis. There is a visitor center at Dripping Springs Natural Area, with handicapped-accessible restrooms, twelve picnic sites, and one large family/group picnic site that can be reserved through the BLM Las Cruces District Office. They don’t allow camping or pets. Dripping Springs is open all year, other than winter holidays, 8:00 A.M. to 5:00 p.m.
$25 reservation for group picnic site. No fee. 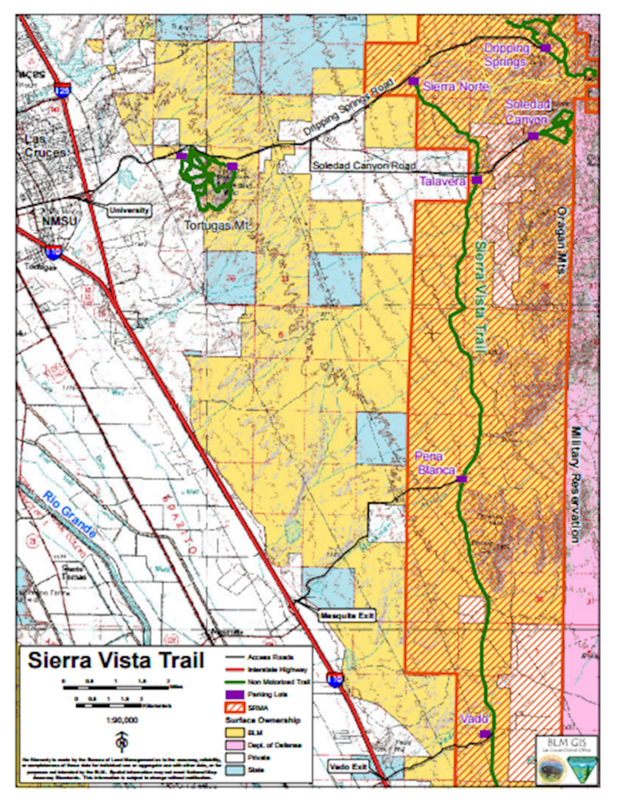 For more experienced hikers, the Sierra Vista Trail runs along the edge of the Organ mountains, with beautiful views of the mountains and the Rio Grande Valley. It eventually leads to Franklin Mountain State Park. There are several trail heads. One is along the Soledad Canyon Road. From Exit 1 on Interstate 25, take University Avenue/Dripping Springs Road east for about 4.5 miles, then turn south on the Soledad Canyon Road. That road will turn east in a mile; follow it until you come to a parking area on your right. You can also access the Mossman Arroyo Road trailhead by exiting Interstate 10 at the Mesquite exit. Other trailheads can be reached by taking the Vado Exit off Interstate 10, and NM 404 at Anthony Gap. No fee. The trail at Soledad Canyon is every bit as beautiful as those at Dripping Spring, but this trail tends to be less populated. 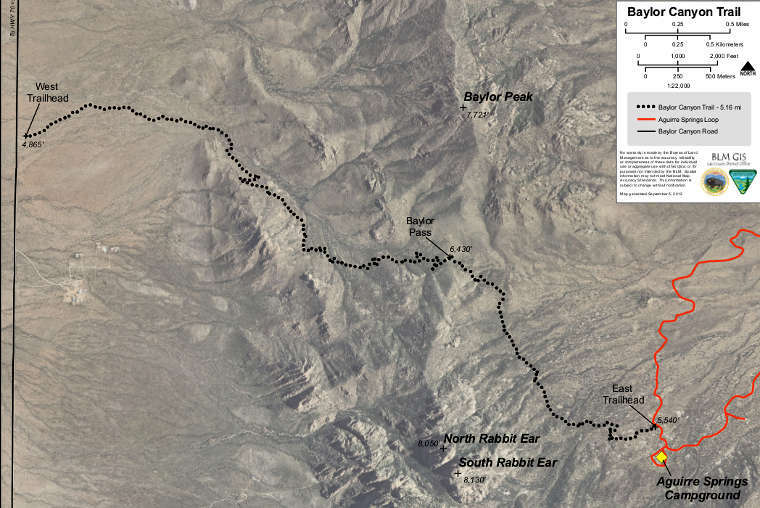 Soledad Canyon Loop is a 3.3-mile loop trail located 10 miles east of Las Cruces. The trails are primarily used for hiking, trail running, horses, and mountain biking. From Exit 1 on Interstate 25, take University Avenue/Dripping Springs Road east for about 4.5 miles, then turn south on the Soledad Canyon Road. That road will turn east in a mile; follow it all the way to the end. It is accessible year-round. Dogs are allowed on the trail, but they must be kept on a leash. To get to the waterfall, stay to the right when the trail branches, then follow the trail counter-clockwise. Approximately 1.5 miles in there is a junction where the trail divides. You can follow the loop to the left, or continue straight ahead to the old rock house and the waterfall. At just over a half a mile there is an old rock house. Continue on the trail to the waterfall. It will head to the right, up a small hill, then left into a narrow dead-end canyon. The waterfall is all the way at the back. To finish the loop, return to the junction where the trail divided. Turn right. Follow the trail back to the parking area. Easily accessible, but seldom hiked area accessed by the road to Soledad Canyon. It is a bit more challenging than Soledad Canyon and Dripping Springs, but a beautiful, less populated option for hiking, with fantastic bouldering available. Take University towards the mountain. Take a right on Soledad Canyon Road, then a left at the fire station to stay on Soledad. Right onto Ladera Canyon Road. After .6 miles, turn left on to an unmarked gravel road. Drive east on country road C077, then turn right onto Soledad Canyon Road. Once at the top of the hill turn right onto Ladera Canyon Road. Head down the road until you see a group of dumpsters. Turn left up the dirt road and follow it through the fence. The Desert Peaks include the Robledo Mountains, Sierra de las Uvas, and Doña Ana Mountains, characterized by desert mountains rising steeply from flat plains. This isolated region was at the center of international territorial disputes that erupted during the Mexican American War and, with the establishment of numerous military forts in the area, it became pivotal in the Apache Wars that followed. The presence of the Apache necessitated the construction of forts to protect early Hispanic and Anglo settlers. The rock cairns marking the boundary of the Gadsden Purchase are a testament to the conflict between Mexico and the United States that ultimately added the enormous western territory to the United States. Homesteads, long abandoned, are gradually disintegrating into the soil. The fading aircraft training targets from World War II are still visible. At the southern end of this stretch of the monument there are 20 miles of dirt trails that once connected St. Louis and San Antonio to Los Angeles and San Francisco. These trails have seen the passage of wanderers, immigrants, cattle drovers, and miners. Fort Mason was a stop on the Butterfield Stage route, which provided mail service for the Western Territory from 1857 to 1861. A few miles outside of Las Cruces, the Doña Ana Mountains are an archaeological, cultural, and recreational treasure trove. The Doña Ana Mountains have extensive pedestrian trails, equestrian trails, mountain bike trails, rock climbing routes, with some areas available for motorized use. No fee. These are the premier mountain biking trails in the Las Cruces area, with miles and miles of trails ranging from beginner or even kid friendly to quite challenging and rocky terrain for experts. Located about 5 miles north of Las Cruces, there are several trails, 15 miles of mountain biking trails and 7 miles of horseback trails (which are not signed as well as the other trails). The southern trails are recommended for beginners as they are reasonably lengthy and not as technical compared to the northern trails, which are shorter, but more challenging. It is also the home of the Horny Toad Hustle, a autumn MTB race, and usually the best attended in the state. Take I-25 north to the Doña Ana exit, go east and turn left on Del Rey, turn at the next right (Calle Las Lomas). Turn left on La Reina, then turn right onto Desert Wind. Go east for about 1.4 miles and go through the cattle guard. On a primitive dirt road, go for another 1/2 mile. The trailhead is just past the power line. No fee. Located just 7 miles west of Downtown Las Cruces. After approximately 1 mile on Picacho Hills Drive, veer to the left onto Barcelona Ridge Road. Travel approximately 1 mile to Anthem Road and turn right. Follow Anthem Road approximately 1 mile to Loop Road and turn right. Loop Road turns into dirt. In approximately 0.9 mile turn right and continue to the Picacho Mountain Recreation Area. Picacho Peak is a 4959-foot high volcanic peak, composed of rhyolite (mostly quartz and feldspar) that solidified at the surface approximately 35 million years ago. The recreation area has over 15 miles of mountain biking, hiking, and equestrian trails. Picacho Peak Via Box Canyon Loop Trail is a 5.5 mile moderately trafficked loop trail located near Las Cruces that features beautiful wild flowers. This moderate trail is primarily used for hiking, walking, nature trips, birding, and horses. It is accessible year-round. They allow dogs in this area, but they must be kept on leash. The Sierra de las Uvas Mountains, located northwest of Las Cruces, include both the Robledo and Sierra de las Uvas Mountains. This area is bordered by Highway 26 on the north and west, I-10 on the south, and the Rio Grande on the east. These peaks provide the northern boundary of the monument. Elevations range from 4,000 feet near the Rio Grande to over 6,000 feet on Magdalena Peak. The varied volcanic, igneous, and sedimentary rock formations provide ample variety for geological sight-seeing. as well as mountain and rock climbing. The Sierra de Las Uvas are popular amongst hunters, receiving heavy local usage. There are numerous trails for day hiking, backpacking, and horseback riding, with stark desert landscapes providing stark backdrops for outdoor photographers. The different varieties of yucca make the Sierra de Las Uvas a prime gathering area for plants. The lush mesa tops support thriving black grama grasslands. Dense stands of mountain mahogany and oak shrub support healthy herds of mule deer. This mountain range includes historic sites like Massacre Peaks, as well as petroglyph-lined canyons like Valles and Broad Canyons. There are several undisturbed pothouse villages and two Lithic Indian sites tucked away in Horse Canyon. In total there are over 30 archaeological sites to explore. The Sierra de Las Uvas range has a rich cultural history that is still visible today. The low, rugged peaks and desert grassland were hunting grounds for Paleo-Indians. These early inhabitants left behind evidence, including a Folsom point found in a remote cave. Prehistoric rock art can be found on cliffs and boulders on the walls of the narrow canyons, like Broad Canyon. In a few areas, the juxtaposition of Jornada and Mimbres rock art alongside the Gaan dancers of the Apache people are a testament to the area’s status as a crossroad for the indigenous cultures that have traversed the area. The Robledo Mountains are a limestone mountain range that began as an “alluvion”, the formation of new land through the accumulated sedimentary deposition of the sea or a river. In this case the ancient, shallow sea that covered this region millions of years ago deposited an enormous amount of material as the water evaporated and receded. This phenomenon, combined with the relative isolation of the region, gave rise to the internationally renown Paleozoic Trackways. Known as a megatracksite, the Prehistoric Trackways National Monument preserves tracks of wildlife that roamed the area 280 million years ago, as well as fauna and petrified wood from the early Permian period. Currently there are no developed sites interpreting the fossils. To preserve the fossils found for future scientific study, some trackway fossils have been removed and transported to the New Mexico Museum of Natural History and Science and the Las Cruces Museum of Nature and Science. The legendary El Camino Real de Tierra Adentro, aka the Royal Road to the Interior, followed the ancient trade routes used for thousands of years by indigenous traders. This was the path used by the early Spanish conquistadors and the waves of settlers, travelers, immigrants, missionaries, raiders and soldiers who followed them. Paralleling the eastern boundary of the Robledos, along the Rio Grande and the fertile Mesilla Valley, the historic trail connected Mexico City to Santa Fe. The route passes the site where one of Juan de Oñate’s colonists, Pedro Robledo, drowned in the Rio Grande in May of 1598. According to local legend, he was buried on the west side of the Rio Grande with a stache of treasure in the mountain range that now bears his name. Another one of the Robledo Mountains famous sites is Geronimo’s Cave, where Geronimo narrowly escaped the U.S. Cavalry. The cavalry saw Geronimo and a group of warriors enter the cave. They waited for them to reemerge, expecting to be able to easily capture or kill them. However, there is a secondary entrance that the cavalry didn’t know about. While they waited outside on one side, Geronimo and his warriors left through the other opening, riding west into the sunset to their homeland in the Black Range. Geronimo wasn’t the only well-known figure from the old west to take advantage of the cover provided by these desert peaks. Billy the Kid hid out on outlaw rock with several other miscreants after his escape from the jail in Old Mesilla. From that perch they could easily see which way the cavalry headed daily based on the dust created. He and the small band of outlaws accompanying him stole cattle when the soldiers from Fort Selden were elsewhere. North of the Robledo Mountains is the Broad Canyon Country. Expansive canyon views taper to sheer rock gorges and narrow passageways, many adorned with images left by the Mogollon and Apache. Draining over 200 square miles, Broad Canyon serves as an indispensable wildlife “highway” between the Rio Grande, the Sierra de Las Uvas, and the Black Range Mountains of the Gila. The intense geologic activity that formed the Rio Grande Rift also sculpted the 500-square-mile Portrillo Volcanic Field. Small mountain ranges, sprawling lava flows, volcanic dikes and plugs, cinder cones, and immense craters make up the stark volcanic landscape. Mount Riley is the highest point in the region, rising abruptly 1,700 feet above the surrounding desert plain to an elevation of nearly 6,000 feet. This remote section of the Organ Mountains-Desert Peaks Monument is one of the largest undisturbed stretches of Chihuahuan Desert in the Southwest. The area was named after a prospector’s pony that was lost in the volcanic field during an Apache raid. According to legend, the pony, “portrillo” in Spanish, was laden with the prospector’s gold. Neither the pony, nor the gold, was ever recovered. The shield volcano, Aden Crater, produced extensive lava flows over 10,000 years ago. The layers of lava are covered by the veneer of the Chihuahuan Desert, with blankets of sand, mesquite, cacti, stands of yucca and creosote shrubs covering a base of igneous rock deposited long ago. Roughly 10 miles south-southeast of Aden Crater, there are several craters called maar volcanoes. A conventional volcano consists of a cone or a shield of volcanic ash and cinders, lava flows and basaltic blocks. A maar-type volcano features a hole blown through the surface of the earth by the pressure of superheated steam, which is created when magma rises and comes in contact with subterranean water. Kilbourne Hole is an internationally famous mile-wide volcanic maar crater thought to be 80,000 years old. It was declared a National Natural Landmark in 1975. In 1928 three hikers found the well- preserved skeletal remains of a late Ice Age creature known as a shasta ground sloth, an animal about the size of a black bear, in a 15-foot by 30-foot chamber at the bottom of a 100-foot-deep fumarole, or gas vent, near the eastern rim of the crater. Apparently the sloth stumbled into the fumarole and managed to survive the 100-foot fall. It crawled into the a small, open space that would become its stony tomb for 11,000 years. The remains provided biological scientists with a glimpse into the animal’s life in a late Ice Age world. Bat guano encased the remains, which preserved the bones, teeth, tendons, hide, and even a food ball in its stomach. The sloth was sent to Yale’s Peabody Museum. Numerous eruptions that blew hundreds of millions of cubic yards of basalt, rocks and sand into the sky formed Kilbourne Hole. The eruptions produced a funnel-shaped crater nearly two miles in length and a mile across. Though much of the ejected material fell back into the crater, partially re-filling it, other material fell around the crater’s lip, forming a rim. The remaining material was scattered across the surrounding desert plains. After the initial eruptions, smaller eruptions produced clouds of smaller particulate matter that consolidated to form stratified tuffs. These have been described as “festooned dunes” because the stratification resembles festoons billowing in the wind. “Volcanic bombs,” or xenoliths, can be found in the vents at the north end of the crater. When the eruptions ceased, the walls of the crater slumped, widening the diameter. Winds deposited dunes of sand around the rim. Due to its unique nature and resemblance to craters on the moon and Mars, astronauts from Apollo programs 12 through 17 visited Kilbourne Hole in the 1960s as part of their geology field exercises. The military still uses the site for training and scientific purposes. The U.S. Border Patrol conducts helicopter training operations around and inside the crater. In this desolate and unforgiving landscape, there are traces of prehistoric encampments. Archaeological evidence shows that Paleo-Indians occupied this harsh terrain for 8,000-12,000 years. Nomadic people used the Potrillo grasslands for hunting, chasing long extinct species, like the Giant Ground Sloths and Four Horned Antelope. Some of the prehistoric sites are located near playas, shallow depressions that capture water and may have provided water for prehistoric corn fields. Other sites are in remote areas, far from any source of water; however, the climate was much wetter then. Early, Middle, and Late Archaic peoples, possibly descendants of the ancient hunters, continued to hunt and forage in the region. The heat emitted by the black lava rock allows grasses to remain green later into the winter. Depressions hold water generating vegetation in an otherwise sparse landscape. The herds of Pronghorn Antelope, Desert Mule Deer, and even Desert Bighorn Sheep made this area a hunter’s paradise. Hispanic use of the Potrillos for hunting continues to this day, with sportsmen pursuing Desert Mule Deer, Javelina, and both Gambel’s and Scaled Quail. The Mogollon culture emerged after the earliest inhabitants. The remnants of a Mimbres Era Pueblo is buried in this geologic wonderland. When the Mogollon migrated from the area in the late 13th century, the Apache moved into the area. By the time the Coronado expedition arrived in 1540, the Apache were a formidable foe, dispersed in small bands throughout southern New Mexico, Arizona and Texas. Their presence deterred settlement until after the Mexican American war. No fee. Aden Crater is located in the northern part of the field. Located about 20 miles west of Las Cruces, the area offers a variety of trails for hiking and biking, with several managed trails for OHV use. From Interstate 10 exit 127 (Corralitos Road) take the southern frontage road west bound for approximately 1.5 miles. Continue straight onto the dirt road (the paved road will curve south) for approximately 4.2 miles. The entrance to the staging area is on the left just beyond the cattle guard. Located about 47 miles south of Las Cruces in a desert basin between the Potrillo Mountains and the Rio Grande. From Interstate 25 take the Vado Exit (10 miles south of Las Cruces) and NM 227 west 3 miles to NM 28. Take NM28 south (left) 2 miles to Dona Ana County Road (CR) B008. Take CR B008 west (right) 11 miles to Dona Ana CR B004 and turn south (left). Drive 6½ miles to railroad tracks. Turn left and cross railroad, then west (right) on Dona Ana CR A017 and drive for 7 miles to Dona Ana CR A011. Turn west (right) and proceed 8 miles to Kilbourne Hole. Kilbourne Hole is on the right, past the big tan dirt bank. The trail here features some brief up and down sections as it follows basalt cliffs along the crater rim. Sandy portions of the trail require endurance and perseverance; the loop feels longer than the eight miles that it measures. With no shade, no water, no facilities, no cell phone reception and the entire area typically all to yourself, this is a true desert hike. The Las Cruces area offers a unique mix of habitats with an impressive diversity of bird watching opportunities. Situated at the north end of the Chihuahuan Desert, Las Cruces has the added dimensions of the Rio Grande River, and the nearby Organ Mountains. Birding hotspots include Dripping Springs, the Old Refuge on the west side of the Rio Grande near Mesilla Dam, the Picacho Bosque Wildlife Management Area, Leasburg Dam and Percha Dam State Parks. Wintering waterfowl and raptors abound at Elephant Butte and Caballo Lake. Birdwatchers can find species that thrive at higher elevation in the cool forests of the Black Range along NM Highway 152. Special arrangements can be made to visit the spectacular Ladder Ranch, just north of Hillsboro, where over 200 species of birds have been observed. The Mesilla Valley Bosque State Park is located on the western bank of the Rio Grande, southwest of the town of Mesilla. The total park acreage is about 945 acres of wetlands and Chihuahuan Desert. Fifty-two acres of the Rio Grande floodplain known as the ”Old Refuge” is the heart of the park. The goals of the park are conservation, education, and restoration. Located on the east side of Organ Mountains, 21 miles east of Las Cruces in Dona Ana County. • Directions: Take U.S. 70 for 14 miles east of the I-25/U.S. 70 interchange in Las Cruces, then turn south on the Aguirre Spring Road (1.1 miles after San Augustine Pass) for six miles. At mile 4 the road becomes a one-way loop and climbs steeply. Las Cruces KOA sits on the west mesa overlooking the Organ Mountains, the city of Las Cruces and the historic Mesilla Valley. It is conveniently located off I-10 at exit 135. Choose from romantic view sites (pull-in or back-in) with 180 degree views, deluxe pull thru sites up to 80 feet long, sodded tent sites that provide a grass carpet under shade trees, or kamping cabins (heated or cooled for your comfort). Additionally, full hook-up sites feature free cable TV and wireless internet access. 50 AMP service is available in our view sites and deluxe pull thru sites. Onsite heated swimming pool, clean restrooms/showers and laundry facilities. Weekly and monthly rates are available. Non-aggressive pets are welcome!